Fiction – Kindle edition; Picador; 300 pages; 2005. 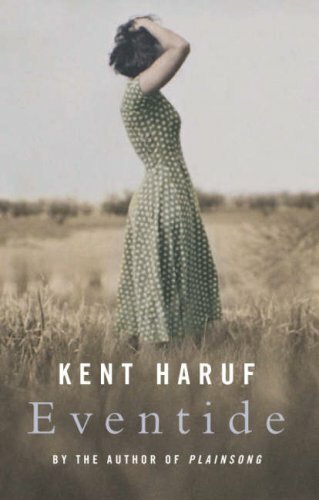 A couple of months ago you may remember that I read — and fell in love with — Kent Haruf’s Plainsong, the first in a loose trilogy of novels set in Holt, Colorado. I loved the story so much that I raced through it in a matter of days and then felt completely bereft, because I wanted to spend more time with those wonderful characters. Which is why reading Eventide, the second in the series, was so enjoyable: from the moment I opened the first page it was like being reacquainted with old friends. Along with the evocative descriptions of rural Colorado — “The blue sandhills in the far distance low on the low horizon, the sky so clear and empty, the air so dry” — there were the lovely old McPheron brothers, Harold and Raymond, scraping their boots on the porch before going indoors. And there, in the kitchen of their farmhouse, was Victoria Roubideaux, the unmarried mother whom they had taken in two years earlier. Ah, remember me, I wanted to say. I’ve missed you guys so much. While Eventide can be read as a stand alone novel, I think it probably helps to have read Plainsong first, if only to understand the touching back story behind Victoria and the McPheron brothers. But aside from a couple of brief references to school teachers Tom Guthrie (and his sons) and Maggie Jones, who had starring roles in the earlier novel, there’s a host of new characters in this one. Oh let them be, the woman said. Are they hurting you? They’re eating a steak dinner and I’m eating beans. That’s hurting me. But would you want to be them? Similarly, Karuf depicts the loneliness of 11-year-old DJ Kephart’s life so realistically that you want to reach into the novel and give him a hug. His tentative friendship with Dena, a girl struggling to comprehend the fact her father has fled the family home, and the way in which they seek solace in each another’s company is tenderly drawn. moments of truth that it’s hard not to see Eventide as anything other than life-affirming. I will admit that I read sections of this book with a giant lump in my throat, and yet there is nothing sentimental or saccharine in the understated, almost flat, narrative. But somehow, in its storytelling, in its evocation of place and spirit, in the characters’ raw and truthful actions, you get so caught up in everyone’s lives that you cannot help but feel deeply moved. I’m conscious that I haven’t really outlined the plot of the Eventide. But there’s not much to say: each set of characters wrestles with individual difficulties, goes through ups and downs, and comes out the other side slightly more confident than they were when they initially started out. And despite the carefully measured, tightly controlled prose, the narrative is utterly compelling — I read this book in the space of 36 hours and then wished I hadn’t been so greedy. The good news is that I don’t have to wait long to visit Holt, Colorado once again — Benediction, the third instalment in the trilogy, will be published in the UK by Picador in April. Absolutely loved “Eventide”, read it a couple of weeks ago, not surprised at the 5 stars here. Looking forward to “Benediction”! I can’t wait for ‘Benediction’ either. Do try his first two novels too, which are also set in Holt and are equally as good. I’ve got an ARC of Benediction but think I will save it up and read a little closer to the date. I notice the Book Depository are already selling it… I suspect it’s the US edition. On the strength of your recommendation I bought Plainsong – it’s by my bed and soon to be read. Now I’ll have to keep my eye out for Eventide. Your recommendations generally fit well with my tastes. So pleased to see that you loved this one too. I hadn’t heard about the third and, lucky for me, it is being released in Australia on the 1st of March so I’ve pre-ordered it. My husband, who is not a big reader, has also loved this series and now we are “fighting” over who gets to read the next book first! This sounds wonderful, thank you for introducing me to a writer that I wasn’t familiar with. I will be adding the first book to my wishlist. He’s definitely one of my favourites. I’ve just ordered a copy of ‘Benediction’ from the Book Depository – the US edition which will nicely match my US editions of ‘Plainsong’ and ‘Eventide’. I know what I’ll be reading next week! This sounds wonderful. I’ve just bought ‘Plainsong’ on the strength of your reviews. Ah, that is nice to know, Jacqui. Plainsong is such a lovely novel; I will always be grateful to author Lauren B. Davis who brought it to my attention. Think you would like this, Stu. Hope you find time to read it at some point. But I know what it is like when you have a massive TBR and so many other books are vying for your attention. There is just never enough time in the day to read everything you want to read, right? Thanks, Lindsay. It is a lovely novel and he is a lovely writer. I am yet to hear of anyone who does not like his work. Thats good to know, Robin. Reading tastes are funny things and until I started this blog I had no idea that people liked the same sorts of books as me… I always thought my tastes were a little out there because I tend to prefer the darker side of fiction. It’s on my to read list now, Kimbofo. I’ve read two books on your recommendation — Plainsong and The Devil I Know. Both winners. Looking forward to your review of Under the Skin… I really enjoyed The Crimson Petal and the White. Have you read Under the Skin? I’m not sure how I am going to review it because I don’t want to give anything away… it’s such a bonkers story, but so fresh, imaginative and original, unlike anything I’ve read before. Precisely… there was a lack of intelligence in the reviews…. No, I haven’t. I’m actually waiting on your review first!! Love this author! I have Benediction waiting – like a prize – to read at some point in the future. Just a brief note to say how much I’ve enjoyed reading both Plainsong and Eventide since winning the Kent Haruf bundle in your Picador/Haruf giveaway earlier this year. The quality of the writing is wonderful and there’s something so very moving and humane about these beautifully-drawn, plain-speaking characters. A few months ago I gave my copy of Plainsong to a friend and she selected it as a choice for her reading group. I’m delighted to say that her group loved the book too; in fact they considered it to be one of their favourites from the various novels they’ve read in recent years. My friend had passed her copy on to her mum, thereby extending the love for Haruf! I’m trying to save the third book (Benediction) for a time when I want the reassurance of returning to the company of a dear friend, if that makes sense! Thanks again for the introduction to this wonderful author. I want to thank you for introducing me to Plainsong and from there Eventide. They were such wonderful perfect books that they really are hard to describe. I picked them up thanks to your review, so thank you. Can hardly wait to read Benediction, but I may hold off for a bit as just finished Eventide.